The most happy face of Indian screen, Shammi Kapoor, is gone. He breathed his last in Mumbai on Sunday 5.15 AM, bringing to an end the era of sparkling energy in Bollywood. 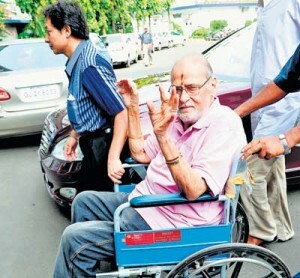 Shammi Kapoor, only one in his own class and style, was admitted to Breach Candy hospital last Sunday and had to be put on a ventilator after his condition deteriorated. His low blood pressure compounded by an infection has been bothering the team of doctors attending on him in the ICU. He has also been suffering from chronic renal failure for past several years and had to undergo dialysis thrice every week. With all these physical problems, Shammi kapoor’s undying ‘Yahoo’ spirit never did desert him till his last breath. I am not aware of his exactly last moments, but he was very much interacting with his family till I checked on Friday evening. My generation of 50s and 60’s has grown on Shammi Kapoor movies. His acting was a rare combination of Sunrise energy and unbounded spirit of youth. His physical movements were a language in itself , which every young man of that age wanted to speak. To say, he was inimitable, is oft repeated sentence for Shammiji. But that did not deter the likes of Joy Mukherji,Biswajeet and many more and even flourish on that. No matter, how poor they looked in their attempts. The evergreen hero will always remain in our memory with his famous Yahoo . May his soul be as energetic in heaven as was during his lifetime. Actor of my fathers time.I used to see my father talking about shammi kapoor in comparison with todays genration new comers.The originality of the then actor reveals the fact of his inner talent. We lost Shammi Kapoor,but the latter will not forget him. Actor of the Century.May his soul rest in peace. EK URJAWAN SITARA ASHT HOGAYA. PAR USNE JO ROSHANI BHIKHERI,JO CHAMAK US WQAT KE YUVAO KE LIYE BHIKHERI THI WAH AAJ BHI CHAMAK RAHI HAI ……AAJ YUVA BHI YAHOOO…..YA BADAN PE SITARE LAPETI HUWE….. GATA HAI.